In his Symphony No. 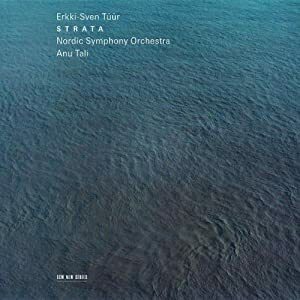 6 (“Strata”) the Estonian composer Erkki-Sven Tuur creates kaleidoscopic soundscapes, whose shimmering timbres ebb and flow in alluring patterns, vibrantly illuminated here by Anu Tali and the Nordic Symphony Orchestra. The disc also includes Mr. Tuur’s sensual “Noesis,” featuring the clarinetist (and composer) Jorg Widmann and his sister the violinist Carolin Widmann as the excellent soloists. (---)Tüür writes music that is highly constructed, though the motivation behind this structuring is to suggest natural phenomena rather than to celebrate cerebral complexities. The music suggests vast expanses and processes of growth. Again, the notes say that he is involved primarily with sound as an iconic structural device, and yes, that’s true to a degree, though Tüür, at least to my ear, is not a composer who uses timbre as his primary material to the exclusion of others. Rather, the combination of color and harmony creates the iconic sonic landmarks of the music (to my ear there’s a connection in his harmonic practice to overtone relations, but it doesn’t sound like the French Spectralists, either). The 2007 Symphony is a powerful work, over a half hour. The gradual developmental strategies suggest both classic Minimalism and Sibelius, though without sounding like either. For me it’s best when it is more relaxed and open; the very loud and energetic middle, while often exhilarating, doesn’t always sound necessary in its activity. But the conclusion, which feels like a slowly turning whirlpool, or the repeated rise and fall of tides, becomes hypnotic. Noēsis (2005) is a double concerto for clarinet and violin, and I find it remarkable. Simply put, the two instruments from section to section fall into complementary ostinati, which repeat almost as though they were set on digital delay. At the same time, small changes are always occurring within each cycle. The orchestra tends to derive its motivic palette from their material, creating vast sonic tapestries that can be playful, delicate, contemplative, or athletic. This is one of the most interesting uses of musical repetition I’ve heard in quite some time, all the more so because it’s so self-evident. The magic comes from it being so obvious yet so seductive. So one work I admire, one I love. A good batting average for this composer, who’s obviously reaching his full command of his vision and practice. Performances are outstanding. Vertical and layered in form, “Strata” is austere and powerful music with a clearly Northern sensibility. The textures swirl and surge restlessly, building tension with harsh, emphatic brass chords set against high winds. There is an instense staccato outburst halfway through – with malign, mach-like drumming passages – evincing the composer’s rock influenes. Near the end, Tüür uses a pastoral motif from an Estonian (“Setu”) folksong, as the music slows down and coalesces in a shimmering coda and a sense of infinity in its long slow fade to silence. Performances by the Nordic Symphony Orchestra under Anu Tali are bracing, powerful, and very well recorded. Highly recommended. Tüür is an outstanding example of a contemporary composer who has developed a sophisticated but immediately communicative style that steers clear of the orthodoxy of the many -isms that have dominated 20th century composition. His scores are notable for the brilliance of their orchestration and sure grasp of large-scale musical architecture. The two works recorded here, Symphony No. 6, ("Strata"), and Noësis, a concerto for clarinet and violin, last 32 and 20 minutes, respectively, and are each in a single movement, but their clear structure and compelling sense of drama keep listeners attentive throughout. The sections of the symphony (which broadly follows the contours of sonata form) are punctuated with a memorable, delicately glistening gesture using harp, celesta, and the upper register of the piano to create an otherworldly atmosphere. In Noësis, which also relies on distinctive timbral combinations, the soloists are very much integrated into the colorful orchestral textures. The performances by the Nordic Symphony Orchestra, led by Anu Tali, capture the vivid colors and evocative timbres of the scores. Clarinetist Jörg Widmann and violinist Carolin Widmannnegotiate Tüür's demanding solo lines with assurance. ECM's sound is clean and natural sounding. This is an album that should be of interest to fans of contemporary orchestral music. Tüür’s recent music is capable of a passionate immediacy that’s often quite refreshing. Yet at the same time, he’s unafraid of employing swaths of dissonance and creating intricate formal desings. “Strata”, Tüür’s Sixth Symphony, is an intense work, brimming with dynamic power. Emerging from icy verticals and bustling counterpoint are myriad swells of knotty cluster chords and fierce, angular melodies, which gradually build to explosive orchestral climaxes. “Strata” is paired with “Noesis”, a double concerto for the sibling duo of violinist Carolin Widmann and clarinetist Jörg Widmann. One again, Tüür has fashioned a labyrinthine journey in a single formidable and fascinating movement. Recommended. There has always been something elemental in a Sibelian sense about Erkki-Sven Tüür’s music; words such as “granitic” and “magmatic” come readily to mind. With the Sixth Symphony, completed in 2007, this elementalism is made clearly manifest. The title “Strata” already suggests a connection with the forces of nature, with rock, with earth, with erosion, and the constantly changing textures of the work reinforce this in no uncertain terms. […] “Noësis”, from two years earlier, is a quite different prospect. Cast as a concerto for clarinet and violin, it deals with philosophical rather than gelogical questions and is correspondingly “airier”. […] One suspects, in fact, that Tüür has become a bashful melodist; it often seems that there are countless tendrils of tunes here endeavouring to escape from the jungel of texture that surrounds them. The performances are outstanding: Anu Tali (b. 1972) already has a very high reputation, and this beautifully recorded and produced disc is without doubt another jewel in her crown. Recording quality is first-class. Er staunt gerne über die Mysterien dieser Welt, auch über die eigenen, die er mit Klängen und immer größer werdenden Klangballungen in die Welt setzt. … So ungewöhnlich Tüürs Musik sein kann, so vertraut wirkt sie beim spontanen Hören, so vielgestaltig und farbig, so erzählfreudig und stimmungskonzentriert. The overall result is music of monumental power but fairly straightforward construction. … His musical ideas … are always well-served by his skill at orchestration. Indeed, the ideas seems to be founded on the orchestral colours used to present them. This is truly idiomatic orchestral music, with every instrument put skilfully to the service of the musical ideas. In this sense, perhaps it is symphonic, although on an extremely abstract level.